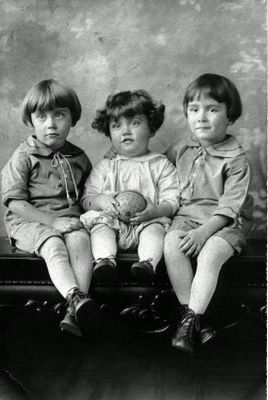 Here’s an early photograph of the three oldest (of eventually six) sons of Evangeline Reba Lynch Towse. My dad’s fraternal (duh!) twin, their little brother, my dad. Picture is a pair with photograph of Evangeline Reba Lynch. 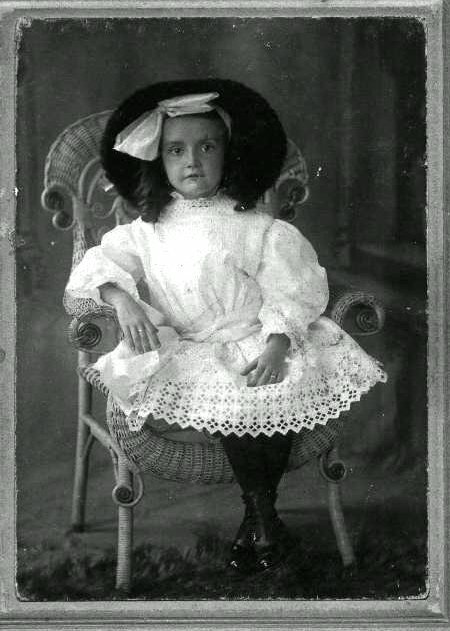 Photograph is of Eva French Lynch? The Towse Five a few years later. 1958. 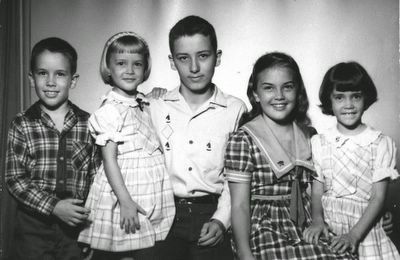 By September 1958 Skip was going on thirteen and away from home, boarding and attending Berwick Academy in Maine, being as there were no English-language high schools in Belém. 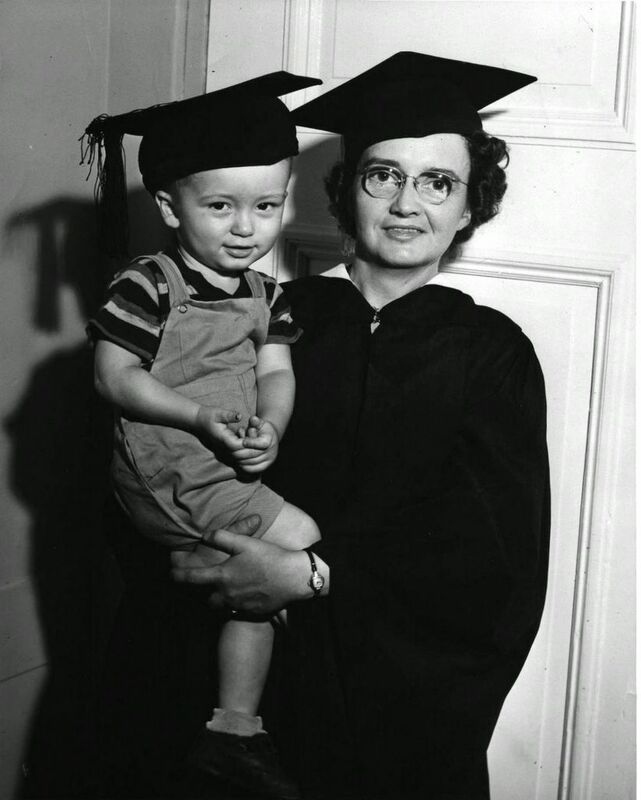 ERLT was the first grandmother to graduate from Boston University. Skip (age one and a half) is the reason she made the record books. I think I have Boston newspapers of the day with this photograph (or one similar) and an accompanying article. My younger sister and I have a story which I’ve batted her with for years. A few years back, she apologized for what was never her fault. It wasn’t my parents’ fault either, but it’s interesting to me, some fifty years later, how small, unintentional things can loom big in a young child’s mind. I’ll tell you from my three-year-old or thereabouts perspective. See that wooden rocking chair that my little sister is sitting in? Why did this memory click at this early age? 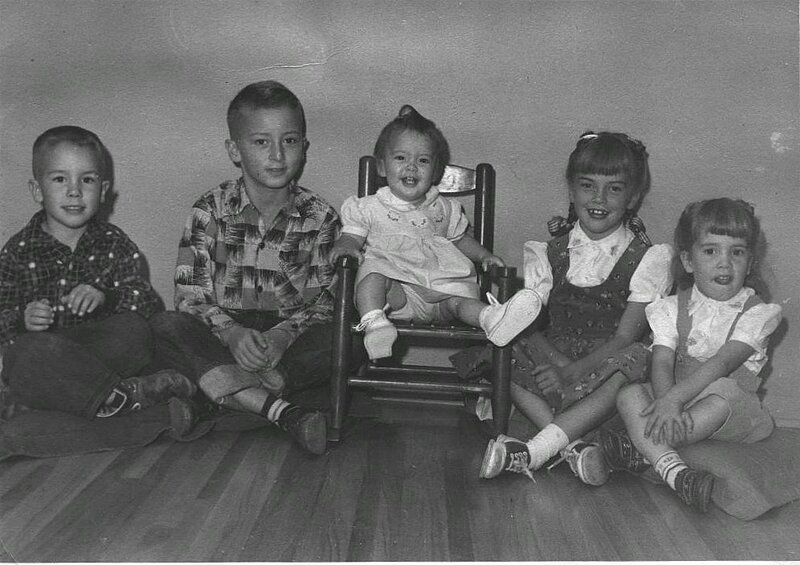 I thought it was so totally unfair that if one of us got to sit in the rocking chair for the family photo that it got to be my bratty little sister when it was MY MY MY ROCKING CHAIR. Why should she get to be center of the photograph and center of attention IN MY ROCKING CHAIR? And, no, my tongue isn’t sticking out for that particular reason. I tended as a child to always be the one (if there was one) to have a tongue sticking out or eyes crossed or to be holding a very large lizard in the Easter photo. When you’re a middle child you have to get attention some way. Finding old photos like this when I’m supposed to be clearing out the back room is one of the graces of moving out of the family homestead. I came back from NC two weeks ago Monday knowing I’d picked up a bug but not feeling too funky yet. I had a luncheon date with Susan, our SF real estate agent, on Tuesday to meet up at the Pan Pacific Hotel for a fundraiser for the National Kidney Foundation of Northern California, sponsored by one of my favorite independents, Book Passage of Corte Madera and the Ferry Building in San Francisco. I walked down from Telegraph Hill, a twenty-five minute walk or so, but had the good sense to ask Susan for a ride back up the hill afterwards. I was clobbered by the bug that evening but figure I would’ve even been worse off if I’d walked back up. Book Passage brings authors to the luncheons. Eat! Listen to the author talk about their latest book! Give money to a good cause! In this case, both Susan and I were there because Bacall was talking about her latest iteration of her autobiography: BY MYSELF AND THEN SOME. We asked for a table near the speaker because Susan has hearing issues and wound up at a table just to the right of the podium, maybe ten feet from Bacall. She was amazing. Eighty years old. (Please don’t mention it when you’re talking to her.) Looks fantastic for someone who hasn’t had facelifts that make it so she can’t smile or move her face (her description of an actress whose name you’d recognize). She’d strained a muscle reaching to work a blind and was in sensible shoes and not walking as perky as she might, but she was grand: funny, self-deprecating, gracious, ascerbic. She told the story of writing her autobiography the first time, twenty-five years ago. The publisher asked her to write it. She knew the editor. She said, sure, although why anyone would want to read my autobiography is beyond me. She said she sat down with a tape recorder: I was born, I went to high school, I went to Hollywood, I married Bogey, … In ten minutes, she said, she’d told her life story. What now? What now? was that she switched to longhand. That slowed the story down and she was getting somewhere until she started staring out the window and wondering whether the frig needed cleaning. Her output ground to a halt. Her editor was patient and patient and patient and finally laid down the law. He told her to report to the publisher’s building where they would give her an office with no distractions to work in. She finished the book and was pleased when it sold briskly. Recently the publisher came back to her and told her that the book was still selling but the publisher would like her to write a follow-on, an update to cover the past twenty-five years. She did. 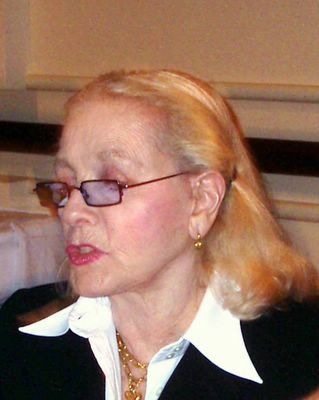 Now, she’s touring around the country flogging her book … at age eighty. She said she wished she could stay longer in San Francisco but her publisher had her scheduled elsewhere and she had to move on. Crossed fingers I’m in the same sort of shape twenty-seven years from now. She mentioned that she knows — and she’s told her Bogart children — that no matter where or when they’ll never escape Bogey’s shadow. She’ll always be the Bacall of Bogey and Bacall. They’ll always be Bogart’s children. Bogart died in 1957 when Bacall was thirty-three years old. Forty-eight years have gone by. She’s made a success on Broadway and elsewhere. She married and divorced Jason Robards. 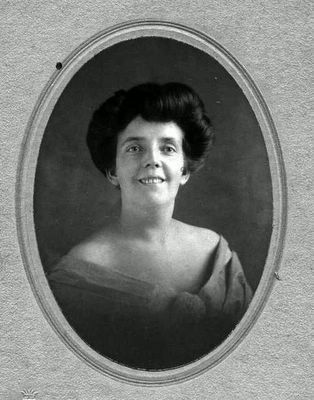 She begat Sam Robards. Still and all, she says, she knows when she dies her obit will mention Bogey and Bacall. Not that there’s anything wrong with that, she hastens to add. She was nineteen when she met Bogart. She married him. He introduced her to acting, to Hollywood. She knows she wouldn’t be where she is today without him and yet … she is so much more than the Bacall of Bogey and Bacall. The luncheon comes with a book by the author. I stood in line (where I took this picture) to have her sign my copy. I bought a second copy and had her sign it too: that copy is for an eighty-year-old woman of my acquaintance. Shhhh. It’s a surprise for Mother’s Day. I mean, I have things to do but I sat wasting time this morning just trying to get my blog template updated to include Jen’s Nobody’s Here. I had a 40 cu yd drop box (note: not a Dumpster®) dropped off this morning. Paid for it yesterday. Drove down to the Green Valley Disposal offices and put over $700 delivery and rental fee on my Visa and signed off on the rules and asked for delivery today, this morning preferably. Rules include “no dirt, rocks, concrete, bricks” and if you load them in anyway, you may get hit with an almost $50 per ton overage charge. One cubic yard of dirt, rocks, concrete, and/or bricks weighs approximately a ton, I was told. (Who knew?) 40 cu yds of yard waste and dead lawn chairs, on the other hand, supposedly weigh about 5.5 tons. Overage charges apply if the weight goes over 5.5 tons. If the drop box weighs over 10 tons all bets are off. According to my lease agreement, I get the drop box for seven days. If I want to keep it longer, GVD will charge me a bit over $100/day. Yikes. His nibs called the guy whose crew will be clearing out the yard and moving the dead water heater and toilet and basketball hoop and what-not out of the horse corral, and getting rid of the pile of crap outside the door here, and getting rid of the pile of crap down by the main house and clearing out the yard and clearing out the yard and clearing out the yard. They’d be here first thing today, he promised, if it wasn’t pouring rain. Well, it wasn’t pouring rain. It was drizzling off and on. I was out moving stuff into distinct “take this away” “do not touch this” piles. Lunch time came and went and they still had not arrived. Afternoon. Dusk. Evening and they’re still not here. I have seven days … and one day has been completely wasted. Forty cubic yards is a lot! BIG BOX! I was promised delivery today and the staff at the office noted that I wanted it first thing, if possible. Note made, I was told, but no promises. Last night I put out the garbage. His nibs had already put out the yard cleanup recycle from some gross raking I’d done during the week and the recycle box of metal scraps|plastic|styrofoam from the partial garage cleanup this weekend. I took out the garbage can of garbage and about thirty paper grocery bags full of paper recycle last night. Moved the pickup into the dirt access driveway on the west side. Tucked the Mini off to the side to make room for the whenever-it-will-happen delivery of the drop box. This morning at 6:22A, I heard a loud thunk in the driveway. I peeked out to make sure they were dropping the box where I’d planned. They did. I fixed my usual mug of espresso then moved the pickup back into the driveway and tucked the Mini up next to it. The guy doing the yardwork had looked at our (relatively small) piles of crap and figured in his head what he was going to rip out of the yard and told me to get a 40 cu yd drop box. I trust he’ll fill it. If not, I’ll ask the neighbors if they have anything they’d like to toss in. Next up! call the stagers and choose a stager to use. Call the painters and choose a painter to use. Call the pressure washers and choose a pressure washer to use. When everything’s set, we’ll need a final go-through house cleaner too. Had I mentioned? Chuck was over last Friday and current plan is to have the house ready to sell by May first. Four weeks. Aieeeee! I spent most of yesterday at the book warehouse space, boxing up books. The books are almost all boxed. After the push yesterday, just a few (maybe eight or ten) boxes worth are still left to box up and label — labels go around kitty corner corners with contents on each side of the corner … so however the box is placed, the contents show. Does that make sense? Am I too compul^H^H^H^Hnscientious? I also need to box up the few books remaining in this place here and there — a box or two in the front office, a box or two in the living room, a box or two in the bedroom. Box. Label. Move them over to the leased warehouse. Need to move the last of the bookcases too, including the one in this office that’s tamped full with genealogy “work” and stamp collection paraphernalia and albums and stamps. Once the bookcases and book boxes are gathered in one place, we’ll call Two Women and a Truck or their equivalent to move the boxes of books out of the warehouse space and up to the loft space. That will free up the warehouse space for all the stuff we have to move out of this place before the place can be staged and go on the market. It’s all logistics, all dominoes. PERT chart where art thou? The warehouse has four rooms. The room I was working in yesterday has 170 boxes of books and thirty bookcases. The room next to it, where I was also working yesterday, has 130 boxes of books. I shifted bookcases from that room to the other room yesterday so they’d all be in one place. The books in the back two rooms are mostly boxed, with a few piles of books here and there. The far back room also has a farm-type dining table that was Case’s and the four chairs that go with it, rugs, miscellaneous other stuff. Two Women and a Truck will move the books out. We’ll fill the place up with the rest of our barnacles and get the house painted, staged and on the market. May 1 is the target date. Susan, our San Francisco real estate agent, said Now!Now!Now! If you have to rent a barn to clear out your house, rent a barn! We don’t need a barn, we have 1000 sq ft of warehouse space and we have until mid-August, when the lease is up, to sort through and move, giveaway whatever we’ve stash in the warehouse. *sigh* Our ancestors lived with what they could carry. CLEAR OUT THE PLACE … NOW!!! I’ve been here going on twenty-eight years. His nibs has been here going on thirty, when he took over from his father, who left some of his barnacles behind. His father built the house in 1948-1949. The barnacles have barnacles have barnacles. The prep work is coming along. Soon the yard work will begin. The piles of junk will be dumped in the drop box. The place is emptying. The books are boxing. Slowly. Slowly. Needs to be done in four weeks. Completely done and ready for some lucky soul to take over. I spent today partially clearing the space back over there that’s tamped full of boxes and what-not. Aieeeee! So what was up with Blogger anyway … Blogger, which was driving me nuts this morning? I discovered today (after bashing my head against the wall for a couple hours) that Blogger was having issues. I’ve added Blogger Status to my Bloglines feed list. We’re currently in the process of rolling back a bad kernel upgrade that has significantly impacted the service. Restored app servers are coming back online and all should be repaired by the end of today. Update: The rollback has been completed and performance is starting to stabilize across the appservers. And, indeed, I can now log on to my Blogger account and after updating this bit will try again to get my template updated with Jen’s Nobody’s Here added to my m.w: baked fresh list. Day’s over. May tomorrow be more productive! Ou sont les Towses d’USA? Ed Hamrick’s Hamrick software, maker of VueScan, offers a non-connected treat on its site: Names. Names is a piece of software that lets you check out the distribution of a given last name in the fifty USA states based on census data from the 1850, 1880, and 1920 Censuses and from phone books from the 1990′s. You can either check one of the breakdowns or you can check “all,” in which case the software displays the maps in rotation making it easy to see how the names dispersed or contracted across the years. Try, f’rex, a good Irish name like Riley or Kennedy. Watch the family spread out across the United States with deep pockets in some areas and then, eventually, as of the 1990′s become just another 1 in 1000 in almost every state. A name like TANIGUCHI only provides one map — the 1990′s — because the name was not common during the earlier dates. This is all very cool, but when I popped my name in, I got, “Unable to find TOWSE in Database. Seems to me if you are one of the 50,000 most commonly occurring names in the United States, the folks showing up in Whitefish, MT, are probably not really from your cohort. GARCIA gives a more interesting map than BAKSHI, but surprise! surprise! BAKSHI =is= one of the 50,000 most commonly occurring names in the United States. LYNCH is interesting. Look at the subtle shading telling you that MA is a hotbed of Lynches as compared to the rest of the states. RILEYs seem to avoid North Dakota. Fun stuff. Good way to spend time with pretty maps. The San Francisco Chronicle reports that Daniel Patterson has left Frisson. His nibs decided that the thing to do — being as we hadn’t made it to Frisson since Daniel Patterson and Andrew McCormack opened it last summer — would be to check it out now and see what Sarah Schafer, the new executive chef — formerly Frisson’s chef de cuisine and, before that, of Gramercy Tavern and Eleven Madison Park in New York City — is up to. Planning to click on the Frisson Web site link? Watch it. The site comes preset with music with a definite Euro-techno beat. I’m just hoping, what with the change in chefs, that the sweetbread ravioli appetizer with black truffle will still be on the menu. This is an acquisition I have to ponder. I’ve never been a huge AskJeeves fan. The search engine seemed more like the Reader’s Digest Condensed version of a search engine … on training wheels. Recently, I’ve been reading some “oh, they’re great … they’ve improved … you really should check them out” reports on various search engine resource Web sites. So, I did. Same reaction as before. Huh? What is Ask Jeeves offering someone out there searching that can’t be better found elsewhere? Well, whatever it is AskJeeves is or is not providing, InterActiveCorp, which is not known for its corporate stupids, thinks AskJeeves is worth $1.8 billion.